We’d love your help. 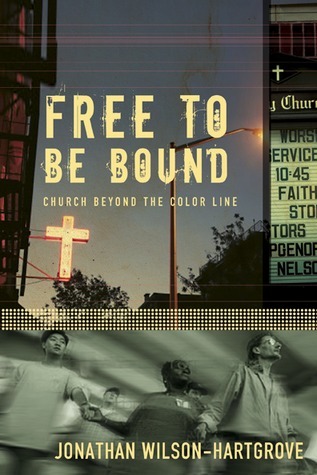 Let us know what’s wrong with this preview of Free to Be Bound by Jonathan Wilson-Hartgrove. Despite Jonathan Wilson-Hartgrove's progressive worldview, he was unaware of the invisible borders separating neighborhood churches in the New South. Then, as a political candidate, he began to reach out to the black community, including a dynamic church. What he discovered forever transformed his view of the body of Christ. To ask other readers questions about Free to Be Bound, please sign up. It's undeniable that we have a history of racial oppression in the United States. But in the context of personal salvation and personal responsibility, so it goes in the mind of many, we need to just let this go, move beyond it, maybe even stop dwelling on it and discussing it so much. Blacks and whites, the argument is sometimes made (usually in white evangelical circles), have opportunities that are theoretically equal and cultures that are different. The fact that we worship differently, in d It's undeniable that we have a history of racial oppression in the United States. But in the context of personal salvation and personal responsibility, so it goes in the mind of many, we need to just let this go, move beyond it, maybe even stop dwelling on it and discussing it so much. Blacks and whites, the argument is sometimes made (usually in white evangelical circles), have opportunities that are theoretically equal and cultures that are different. The fact that we worship differently, in different places, is simply historical and cultural contingency and doesn't reflect significantly on the nature of the Christian church itself in America. Jonathan Wilson-Hartgrove doesn't agree. Wilson-Hartgrove is part of a growing voice in evangelical circles calling for the Church to address systemic sins, institutional injustices, things that we've inherited and for which we'd like to continue telling ourselves we bear no responsibility. He's certainly not alone in this. If I had to pick one primary thing that's changed or is changing on the evangelical landscape in America it would probably be this: a growing awareness that salvation isn't a personal issue, that there are a host of things we simply can't shrug off with an attitude of "Oh that's too bad but don't make me feel personally guilty about it because it's not my responsibility." That approach-- the understanding of salvation as being this entirely personal thing between me and Jesus-- doesn't work anymore (if it ever did). It doesn't work for the environment. It doesn't work for the context and the consequences of consumerism. It doesn't work for rampant militarization. And it doesn't work for race. We've inherited structures not of our own devising, it's true, but by accepting them as inevitable or as too overwhelming or entrenched to address-- be that environmental degradation, a disposable economy, a self-perpetuating War on Terror, or the racial injustices that continue to create a stratified society-- we add our culpability to their perpetuation. This is a book about one of those systemic sins, racial prejudice and segregation, but it's also a book about how to understand Christianity. As Wilson-Hartgrove argues, there are two strands in Christianity that are relevant in the context of race: one that says to live quietly doing good works, and another, revolutionary strand that says the Kingdom of God exists in opposition to racial injustice now, not in some apocalyptic hereafter. The battle against principalities and powers, according to this second strand, is the battle against systems in which lives are devalued, exploited, and destroyed because of skin color. Of course Wilson-Hartgrove's position (in as much as he takes a position in this book, which is largely a narrative of his own experience in a black community and congregation in Durham, North Carolina) is a bit more nuanced than simply a call to arms or a condemnation of the Church's implicit acceptance of these power structures in our history. Indeed, he talks about the danger and pitfalls of believing that we as privileged white Christians can rush in and fix things with programs and good intentions, especially things as thorny as racial injustice. Usually our best intentions find us simply making the problems worse or perpetuating the hierarchy of power. What then is to be done? This is where the author's position becomes truly radical and hard to swallow-- not so much because of its enactment as in its implications. The book is Wilson-Hartgrove's story of becoming a part of a black church, of a white boy from the south living, worshipping, and serving in a black community not in an attempt to fix anything apart from his own view of Christianity. He is there (with his wife) simply to learn. The idea, he would say, of successful racial reconciliation, of "crossing the color line," is to do so in a spirit of submission, to be powerless and humble, to simply live in community and learn. It's clear he's done this, both through his own scholarly work at Duke (though this book is an entirely accessible popular account) and his experiences. The text is filled with episodes from his life in Walltown and with history and literature from the black experience in America. It's not a "how to" book, as the author admits, on anything. It's simply an account of one person's attempt to understand race and what it's meant for the Church. What's harder to accept though are some of his conclusions from his experience, namely that Christianity in America has been defined by the question of color, that there is truly a black Christianity and a white Christianity, and that the most genuine Christian experience in America-- the experience that has been closest to persecution, abuse, and brokenness-- is the black experience. White Christianity, Wilson-Hartgrove maintains, lost its credibility by participating, perpetuating, and even justifying first slavery, then segregation, and now enduring prejudice and systematic injustice. The true miracle of Christianity in the New World is that blacks took from their oppressors the genuine parts of Christianity while rejecting the hypocrisy. If you want to know real Christianity in America, the author claims, a place where Christ has been and remains with the despised, outcast, and down-trodden, you have to go to the black church. This book makes me sad like the rich young ruler who wanted to follow Jesus but went away because he was very rich. I'm the young ruler, and I'm very white. And though I can see the truth in what Wilson-Hartgrove is saying, I resist an interpretation of his claims that would be exclusionary. He seems to be saying that it's all about black and white, that in the American Church this is the problem, and that in American this particular instantiation of Christianity (the black church) is most genuine. That seems dangerously reductionistic. What about the Christianity of the reservation? What about the Old World liturgy of the immigrant-- be it Greek, Armenian, or Hispanic? An uncharitable reading of this book might be that you have to be black to genuinely know Christ in America, or at least be bound to a black community and congregation. This book wrecked me and brought me back to life. I needed a book about racial reconciliation from the guidelines of scripture and how we're all in this together. No matter how bad it gets. God used this book in this season in my life. I recommend you read it. I was challenged deeply by its words and ideas. Praise God that we are free to be bound together in Jesus. For He is freedom and the Way. Jonathan once told me that he wasn't convinced that this book entirely "worked," but I have to say that I respectfully disagree... it does work, largely because it is written not only out of first-hand experiences but also from the hand of one who is deeply informed politically, socially and theologically. A necessary read for suburban Christianity. Jonathan's own journey from Klan country to a pre-dominantly Black church (he's white).